Mr. Tyrone Brown came to Rainbow Kitchen Community Services (RKCS) in February 2014. He had seen a flyer for the Personal Paths Case Management Program at the Carnegie Library of Braddock. 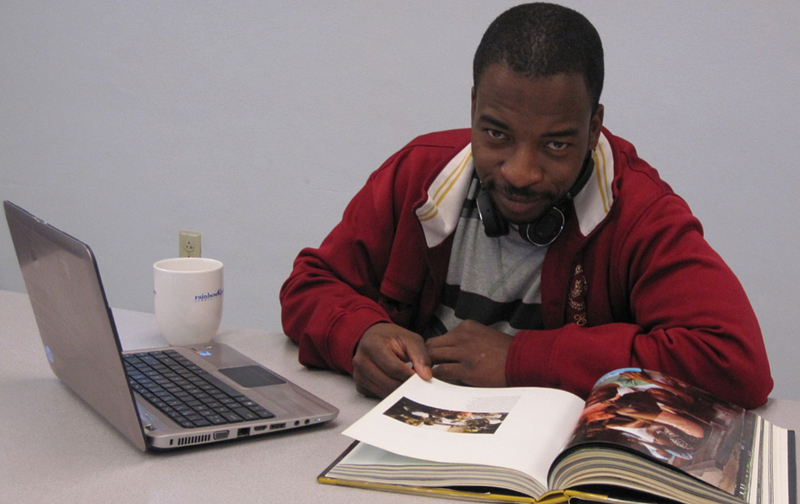 Mr. Brown was seeking guidance and support to help him achieve his goal of self-sufficiency. Mr. Brown had spent the last seven years in and out of jail, had previously started college but did not finish, was residing at Gateway Braddock Corrections Program, and had prior work experience in commercial cleaning, telemarketing, and warehouse work. The RKCS Case Manager, Renee, met with Mr. Brown to discuss his personal goals and how they could work together. Mr. Brown set goals of obtaining gainful employment, securing affordable housing, obtaining transportation assistance, completing college, setting a budget, and obtaining health insurance. Renee worked with Mr. Brown to formulate a plan incorporating his goals and breaking them down into workable steps. Mr. Brown was highly invested in moving on with his life in a positive manner and exhibited a strong determination to access all help and services available. Renee referred Mr. Brown to Career Link, and he utilized their services for help with job searching, interviewing skills, resume writing, and job readiness. RKCS was able to help him with bus fare for his job search through the Community Service Block Grant (CSBG) Client Assistance Fund. Within a month of entering Rainbow Kitchen’s Case Management program, Mr. Brown obtained gainful employment that offered the possibility of medical benefits. Initially hired through an agency to work at a food production plant, he was hired on full-time after 90 days, and he now receives medical benefits through his employer. Once employment was secured he opened a saving account. Mr. Brown researched schools that offer Information Technology courses and chose to attend ITT Technical Institute. He met with the school’s financial aid staff and, with their help, was able to obtain the grants and student loans he needed. He started full-time college classes in June of 2014. Mr. Brown has also been approved to receive grant money to assist with his college expenses this year through Allegheny County DHS CSBG Funding. This funding assists with transportation funds, books, supplies, and tuition. He has completed his first quarter and has a GPA of 3.33. Next Mr. Brown formulated a home plan, started to save money for security deposit and rent, and searched for decent, affordable housing in a safe neighborhood located near public transportation. Through resources from Gateway Braddock Corrections and his RKCS Case Manager, Mr. Brown conducted a thorough housing search and chose a one bedroom apartment that met all of his criteria. He was able to get financial assistance through Urban League of Greater Pittsburgh for his security deposit, and he used his saved money for rent, furniture and other household needs. RKCS assisted him with an initial food supply and household items. Due to steadfast determination, Mr. Brown was able to achieve his goals to become self-sufficient. He now works full-time with medical benefits, attends college full-time, and maintains a monthly budget. He does not receive any benefits from Department of Public Welfare and does not receive rental assistance from any program. His RKCS Case Manager continues to provide him with non-judgmental support and guidance as he works on his current goals. Mr. Brown says “Rainbow Kitchen, and especially my individual appointments with Renee, help to keep me on track and focused to succeed in my goals by providing continual communication, referrals, and support.” Mr. Brown is very grateful for the assistance and support from RKCS. He feels the individualized attention he receives from Renee has helped him take the right steps to a better direction in his life. Mr. Brown’s plans are to be a productive community member, graduate college in June 2016, work in the IT field, regain his driver’s license and purchase a vehicle, save money, ultimately open his own business, write a motivational book, and live his life in a positive manner being the best person he can be.